The one I will show you how to make is my own pattern. Ariel wanted to sew her friend a dress and I knew we were going to need to keep it simple. I started to help her use one of my Simplicity doll patterns, and then decided it was beyond the simple sewing skills of my daughter. We threw it out! This is what I came up with, a very basic dress that my daughter could sew, but one that is still pretty. Ariel calls it a formal dress since it's so long on the doll. In order to make the pattern, I decided I should make another dress for Ariel's Kit doll. Now her and her friend will have matching dresses! When you print out the pattern pieces make sure you print actual size. Don't scale it down for the page, as it will be too small for your doll. Even fractions of an inch will be too tight. I made the dress very form fitting. I like to make the cuffs of the sleeve a contrasting color. You could even make the bodice pieces a different fabric. The skirt pattern piece is missing a tiny little corner. It's just barely too large for a letter size piece of paper. Your printout should take up the entire sheet of paper. I taped on the tiny piece that was missing. To start off, I first sewed the shoulders, with the fabric right sides together. I try to do 1/4 inch seam on most of this dress. The clothes are so tiny that when you do anything larger, you lose part of the dress. 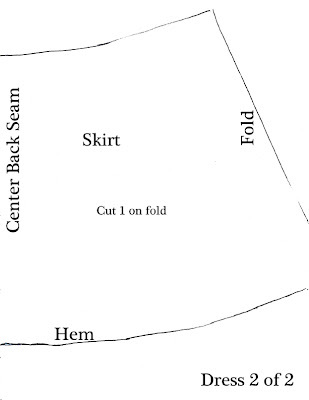 You want to do a small hem on the neckline. 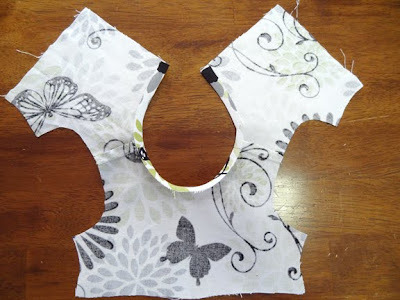 Before you sew your cuffs onto the sleeves, you first need to iron them in half lengthwise. Next pin them onto the sleeves with all the unfinished edges together. The cuffs should be a little bit longer than your sleeves. Trim off the excess. 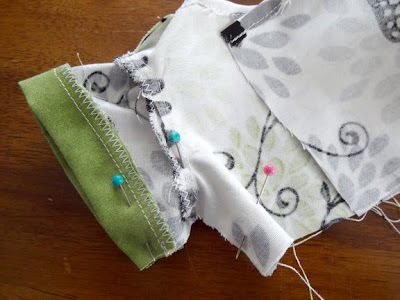 I like to use the zigzag stitch to close my seams and keep them from fraying too much. I iron the seam toward the sleeve. Then I do a quick gathering stitch on each sleeve. 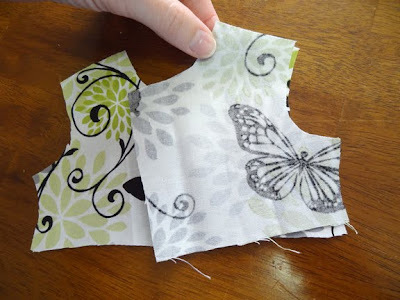 Pin your sleeves on the arm holes, and then stitch them with a 1/4 inch seam. You really need these sleeves on tight! The dress is so tight, that you'll be tugging quite a bit on the arm holes to get the dress on. Now we sew the armpit. On this seam I try to keep it very small, and I reinforce it with a zigzag stitch. 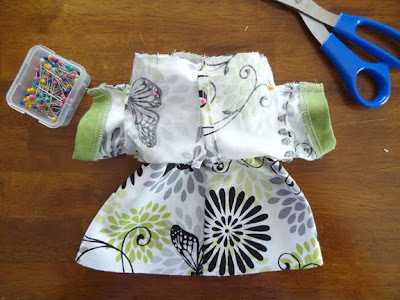 If you do an entire 1/4 inch, you will have trouble getting the dress over the doll's body. 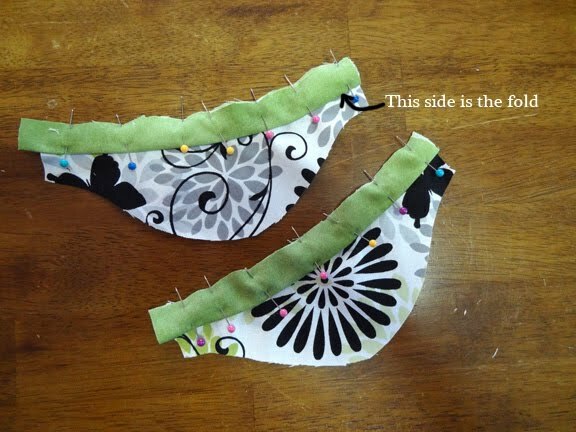 You need to hem the back bodice pieces. 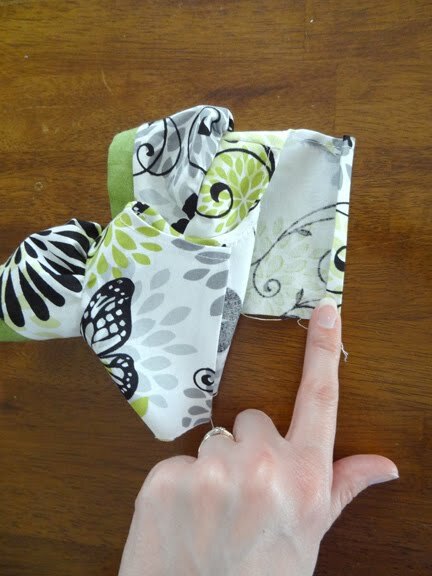 This time I do a double fold for the hem, but still keep it small. You need as much as you can get to get the dress on the doll. Now that the bodice piece is finished, you need to work on the skirt. I used a 1/4 inch seam here. Once you're finished you can flip the skirt to the right sides showing. This really is a very simple dress. We're almost done! To attach the bodice and skirt, I placed the skirt in through the neck hole. 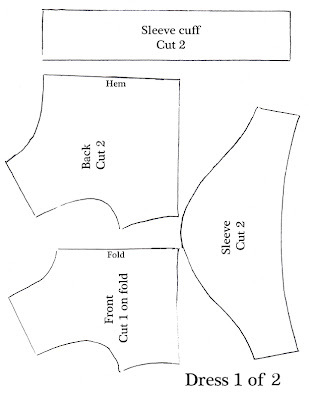 You need to line up the seam you just sewed on the skirt, with the back bodice pieces. I first pinned the back closed then I pinned it to the skirt. This part is kind of tricky to sew as the opening is not very large. The pieces should be the same size. I noticed when my daughter did the sewing; the skirt was a little bit too large. You can take in a little on the waist, but I would try to make your seams smaller on the bodice instead. (The parts that you hemmed on the back bodice pieces or on the armpits) Again if it's too small, it won't fit over the doll's body. This dress is very snug! You're almost done! 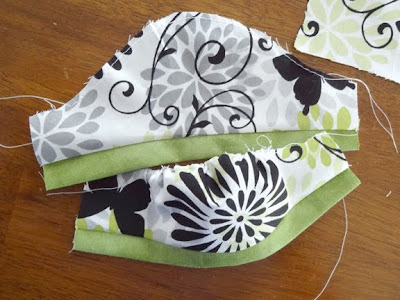 Depending on how long you want the dress, you need to do the skirt hem. I did a double fold about 1/4 of an inch, 1/2 inch total. The only thing left is to decide how you want the dress to close. You could sew snaps on, or use Velcro. My sewing machine sews buttons on really easy, so I opted for one button at the top. I love how the dress turned out! I think the part I especially enjoyed was how easy it was to make. I've made my daughter some complicated doll clothes in the past that take me all day long to make. This one only takes about 1 hour to put together. 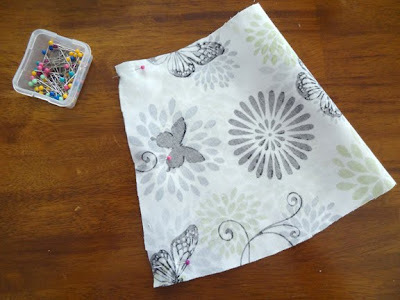 (Two hours if you're like my daughter and new to sewing) Simple, but beautiful. You gotta love that! Thanks so much for sharing this pattern with us! My daughter would love some more dresses for Felicity! Thanks for sharing! Cute dress, and I like the fabric you found, too! Thank you for sharing this pattern! It's a modest style and really darling! How do you access the pattern? Do you just click on the picture and print from there? Thanks. This is very cute basic dress. You can just click on the picture to print it, or save it first. Don't scale it down at all, otherwise it might be too tight to fit the doll. Thanks so MUCH for this ADORABLE pattern! I have my DD's original AG dolls from early 90's (Pleasant Company) and don't have any newer ones, so not sure how size might vary. I was unable to get doll arms into dress (following your instructions), so cut 1 1/4" from TOP of skirt, which gave me more for back skirt seam, sewed skirt to bodice and seamed up back about 4 1/2" from hem, inserted a 7" centered zipper (cutting off excess @ zipper bottom) and it's PERFECT -- LOVE it!!! I still made a 1/2" hem, doubling over the fabric. AGAIN, thank you SO MUCH -- so SWEET of you to share your talents with all of us who LOVE our AG dolls! Thanks again for sharing. I LOVE the pattern. and you chose really cute material too. ;) I will be searching for something of a vintage nature too. Make sure you keep your seams really small, or cut the pattern a little bigger. It's a very tight dress. I assume you could use a knit fabric vs woven, right? I love to sew with knits, and have lots of scraps. I'm going to try one tomorrow and will send pics if I can. I just made this for my little girl yesterday (in fabric to match a skirt I made for her a couple weeks ago). 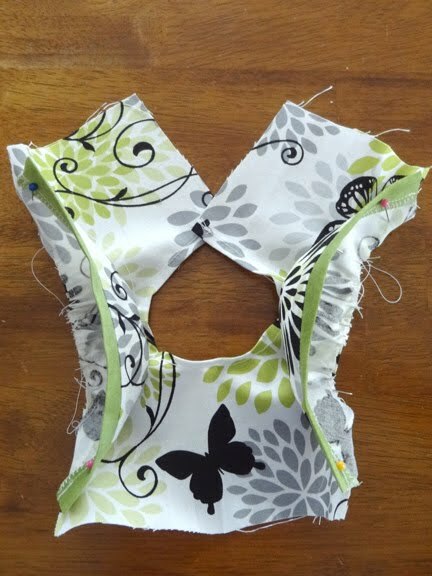 It was very easy and I used a serger on the inside seams. Such an easy pattern, thanks so much! When I print these pages, it is not really taking up the full page, and I am scared to proceed not knowing if I have the pattern pieces big enough. Would you be able to let me know some measurements of the pattern pieces when they are printed correctly? That way I can enlarge them to the proper size if necessary? I measured the sleeve cuff on the first page and it is 6 3/4 inches in length, the width looks to be around 1 1/2 inches. If I were to make the dress again, I would cut the shirt front and back pieces a little bit larger than the pattern piece I have drawn. the pattern images are definitely not coming up with those measurements. Even when at full sized on the internet. I know how to enlarge in my editing software, but I just wanted to let you know. excellent freebie. Thank you tons. 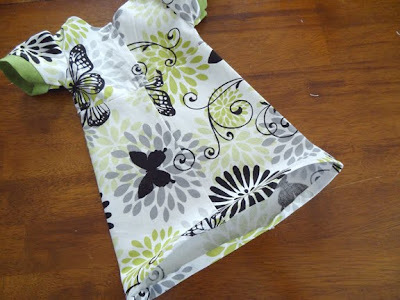 Thank you so much for sharing this cute dress idea and pattern. I am making clothes for three dolls this year and this dress is a perfect addition. This is beautiful! I can't wait to try it. My 8-year-old is learning to sew. I think this will be a great project for us to do together. You said you'd make the shirt front & pieces a bit larger. Do you think 1/4" would do it - sides only or all the way around? Thanks so much! I think I did 1/4 inch for all the seams. Thank you for taking the time to post. Very talented. thanks for the pattern I will make this for my daughter's doll. I got the fabric from Hobby Lobby awhile ago, and was just using the scraps from another project to make this dress. If you have access to a copier that enlarges, I found that enlarging the pattern 135% gets it to the size needed. Hope this helps! I copied and pasted them into Word. Then I set the margins at the smallest point and filled the page with the image. The dress fits, so it worked. I just made this dress for my daughter's birthday. It turned out so cute. Thank you so much for sharing your work and talents with the rest of us. I think our dolls will be wearing a lot of these dresses. Oh, I LOVE this pattern! I can't wait to make it for my daughter's doll! Quick question: since the dress is fitted, is it hard to make the doll sit down in it? My mom also has a doll that she displays sitting on a little chair and I was just wondering if it looks ok in this position. Thanks again! Your doll should be able to sit just fine. It's only fitted in the very top of the dress, not around the waist. I click on the dress pattern and all I get is a smaller shot of the piece? Should I print that and enlarge it? How much? I can't seem to print the pattern out! Also I support a little girl in Uganda and wondered if I could sell the doll dresses I make from your pattern. This pattern doesn't print out the right size no matter what I do. This dress is pretty tight on an 18" doll. I don't think it would fit that size bust. Amanda, As moderator of the Yahoo Group, SGOTs_AmericanGirlDollGroup, I would love to have the gals do your dress as part of a sew-along. Would you have objections to this? Love your Blog. Melinda C.
No objections at all. :) I'm glad you like the dress. I'm little confused- is the 1/4" seam allowance already part of the pattern, or do I need to add the seam allowance to the pattern? When I made the dress in the pictures above I did not add any extra seam allowance to the pattern. It's a tight fitting dress. I personally like it that way. But I know it can be difficult to get the dress on your doll depending on her shape. Every doll is not the exact same size. You can add the 1/4 inch to the pattern to be sure it will fit. Thank you for the pattern. Im a MeeMaw sewing for a Grand daughter. I looked at pattern page and determined the pattern was to be printed in a portrait view, not landscape view. I just want to verify. For those having trouble do not check the "fit" box on you printer. I haven't sewn the pattern but I printed in both views to check. Thank you again for your hard work. My Granddaughter will love this pattern. I might sugget you draw a ("1") line on your pattern as a guide. Kinda like a map. That way all anyone has to do is calulate the difference and either enlarge or decease the size of the pattern on the copier. Thank you again. i went onto your blog and now i cant get out! What's wrong? the exact size needed. Too much trouble to enlarge. The pattern is posted to the correct size. I made the dress to be tight fighting, as you can see from the photo of the doll wearing the dress. I don't enlarge these pattern pieces when I sew the dress. Thank you for this pattern. I created my first doll dress with the machine I got for Christmas. It turned out very well. I enlarged the pattern to 135% and it fit my larger American girl doll well. Thank you so much for this pattern. We just gave my niece an 18 inch doll for Christmas. I love that this dress is longer. The length of the skirt is perfect for our family. THANK YOU!!! 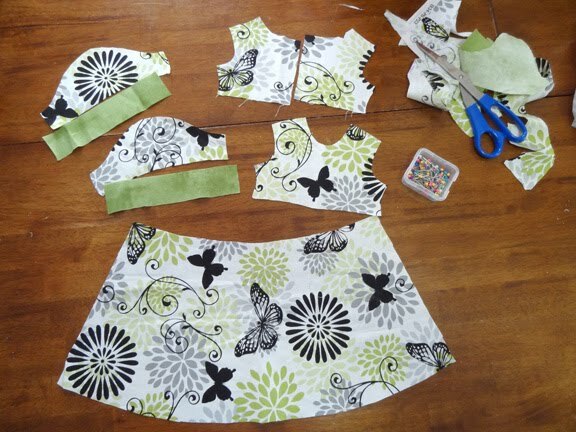 I am a quilter but have never attempted clothes before but my daughter begged me to try. I bought the McCall's pattern and was completely lost. I found yours, it was so easy to follow and it came out great! Thank you again! How do I download your pattern? I love it! I right clicked on the photo and saved the image. Then, I printed the image as an 8 1/2 x 11 photo. Seemed to work for me. Hello! Thank you for the pattern dress! sewed for her, but changed her skirt. made her lush. But my dress was very wide at the doll. I do not know why. It was the first dress for American girls. Can I still have to learn how to sew. I absolutely love this pattern! I have modified the pieces a bit and have already made a 30s dress and a 70s dress from it and am now working on a dress styled after Chrissa´s meet. This is incredibly versatile and so easy to make! Thank you for sharing!!! I tried printing out the pattern and it wanted to print the whole website. Ok, this was super hard for a novice like myself :( I hope to try again after I learn more. This was really cute. Thank you for this pattern!! Just made one dress and am about to start a second. I added a narrow Peter Pan type (but in one piece) collar. I love the way it came out! I recommend 1) hemming the back bodice pieces BEFORE you sew the under arm seams and 2) sewing the hem on the skirt before you sew the back seam. What a wonderful post. Great idea flawlessly executed. If the pattern is posted as a PDF file everyone will be able to print it to the size that it was intended vs trying to figure out what size it should be copied at. Thanks for the advice! The pattern is now posted as a PDF file. When I posted this 4 years ago, I never imagined it would be as popular as it has been. I hope this makes it much easier for everyone to use. I have a question. 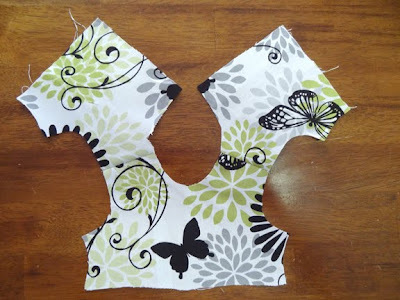 Does it matter what way you cut out the pattern?? Also, should I enlarge the pattern? I made this dress, but I also added about a half inch more fabric in everything, including cuffs. It worked out great!!! I am now a proud owner of a great doll dress. Thank you so much for posting this pattern! I able to slip it on with ease. But, instead of after I hemmed the skirt before I sewed it together. Do you have any more doll dress patterns?? I cannot get the pattern to print either. Any ideas? Thanks. NIce. Buy Elegant Designer Evening Dresses | Prom Dresses | Formal Dress for Women! Thank you for the simple doll dress pattern and ideas. Thank you very much. I can use this for my school activity. Thank you dress pattern is simple.Good job. Thanks for posting! 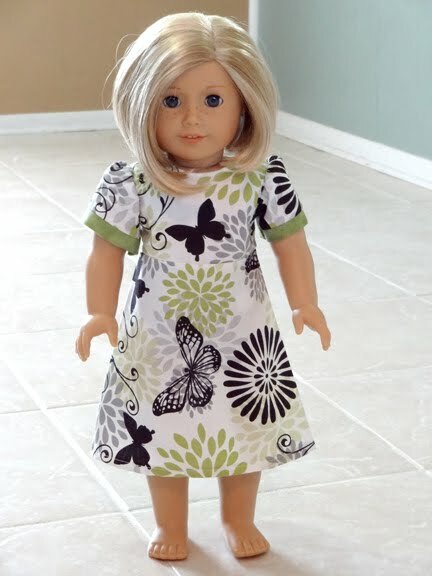 This is the best style I’ve found for an easy AG doll dress. Only issue was, my finished neck didn’t look good. So, as a trial, I cut a 1 1/4” facing, sewn right sides together to bodice. I have no idea if it will fit, but here’s hoping. Where is the actual pattern to download?